3D-ICONS Ireland – fulfilling the potential of a rich 3D resource. Corns et al. Internet Archaeol. 43. There is a growing awareness that many important heritage and archaeological sites are vulnerable and exposed to potential threats. Natural disasters, such as earthquakes and violent storms, have led to the destruction of countless important sites (IPOL-CULT_EU 2007), and this has been exacerbated in recent times by deliberate acts of aggression – ideologically driven or mindless acts of vandalism (Curry 2015). Once destroyed these important parts of our past are lost forever. Over the past decade, however, there has been a growing recognition that 3D surveying methods can play an important role in the preservation of cultural heritage structures and objects through a process of 3D digital documentation. High-resolution 3D surveying techniques – such as terrestrial laser scanning – are ideal for recording heritage sites where vernacular construction methods have made straight lines and regular geometries a rarity. Projects such as Cyark and the ScottishTen have championed the cause of this approach and have played a major role in raising the profile of 3D digital documentation. In light of such projects a three-year collaborative EU co-funded pilot project called 3D-ICONS began in February 2012 with the objective to create a range of 3D models of the iconic archaeological monuments and architectural buildings of Europe that would be available online to the general public. Core to the project was the development of a pipeline for the production of such models including: capture methodologies, 3D modelling and presentation processes, metadata, licensing and 3D data IPR, and finally the potential application of the data in sectors such as education, tourism and conservation. The Discovery Programme was invited to represent Ireland, bringing our experience in 3D data capture to the project. The first task was to collate a list of sites and monuments in Ireland suitable for digitisation, representative of both the range of cultural monuments found in Ireland, and the complexity of the documentation challenges. Working from the UNESCO world heritage sites list and those proposed on the tentative list for Ireland (World Heritage Ireland 2016), 21 cultural heritage sites were selected, ranging from complete ancient landscapes such as Brú na Bóinne, the location of spectacular megalithic tombs to detailed carved high crosses, such as those preserved at the medieval monastery of Clonmacnoise. The survey methodology depended on the scale of the site, and could be divided into three categories. Cultural sites defined by landscapes were documented using existing airborne laser scanning (ALS) resources, both from fixed wing and helicopter-based systems (FLI-MAP 400). Upstanding monuments and architectural buildings were surveyed using a Faro Focus 120 terrestrial laser scanner with georeferencing provided via a Trimble 5800 GPS using VRSnow NRTK corrections. Detailed objects such as carved stones and architectural details were recorded using an Artec EVA handheld optical scanner. Although three very diverse techniques, the result of this digitisation was high-volume, high-resolution 3D data. These are scientific datasets of exceptional value to engineers and architects and they can play a major role in monitoring and conservation of cultural heritage sites. Point clouds are an increasingly common survey output and most geomatics professionals are now comfortable viewing and manipulating such data in specialist software. However, to the general public such data can be very difficult to access and understand. Interaction normally requires installing third-party viewers, and navigating through the point cloud; an unusual environment for the inexperienced and can be disconcerting, as solid walls can appear transparent as the space between points increases on closer inspection. In addition, 3D models have relatively large file sizes, commonly 10-20 GB, which can be difficult to distribute via the web and a challenge to display on a standard PC. Rather than viewing point clouds, inexperienced users generally find it easier to interpret and interact with surface mesh models, particularly when photo realistic or enhanced surface textures are added. However, if the model retains an appropriate resolution then the file size is likely to be excessive and not appropriate for accessing via the web. The solution came from looking at techniques and software more commonly associated with the gaming industry. By utilising UV maps, a high-resolution surface model of an object is stored as a normal map, which would be subsequently applied to a retopologised low polygon model re-creating the appearance of the higher resolution 3D model. A relatively simple concept, but one requiring access to and experience with a diverse range of software. The detailed stages of this solution are outlined in the example of St Kevin's Church, a small structure in the monastic settlement at Glendalough, Co. Wicklow. This small 11th- or 12th-century church with a stone roof presented a typical challenge encountered in the project. The primary data was captured using a Faro Focus 120 laser scanner, resulting in a final segmented and geo-referenced point cloud containing 212 million points. The data file in Faro format was 1.48GB, and when exported as an ASCII xyz file was 7.5GB. The first processing step resampled the point data to a uniform spacing of 1cm, removing unnecessary points where data overlap was excessive while retaining all the relevant detail. This process also reduced noise from the data and created a uniform cloud, which would be beneficial to the creation of mesh surfaces. The xyz ASCII file was now 330MB, down from 7.5GB and less than 5% of the original. This ASCII file was imported into Geomagic Wrap, a powerful point-to-mesh modelling software. Here, a high-resolution mesh was generated and a number of functions applied to the mesh model, including the removal of spikes and outliers and the filling of holes within the data. This cleaned, high-resolution mesh model (17.6 million polygons, file size 1.34GB) was exported as an .obj file, the industry standard for a mesh. The resulting high-polygon mesh was simplified and resampled (approx. 1% of original size) to form a uniform low-resolution TIN model. The high and low resolution models are then imported into Autodesk Mudbox where they appear in the same model coordinate space. The low-resolution mesh was then re-topologised in order to create a mesh suitable for texturing. The result of this process was a low-resolution mesh containing only 200,000 polygons, with a file size of 10.4MB. The next step was to generate a series of UV maps of the low-resolution mesh utilising the Unwrella plugin within Autodesk 3DS max. UV mapping is the process of projecting 2D textures onto a 3D model, with U and V denoting the coordinate axes of the 2D texture. This UV map was the key component as it acts as a projection framework on to which all surface textures conform. A UV normal map was then extracted from the high-resolution mesh model in Autodesk Mudbox. Normal maps store the direction of the normal of the high-resolution 3D model, and when applied back onto a low-resolution model, the texture pixels dynamically control how the light interacts with the model surface, creating the illusion of a detailed 3D surface. The second map applied to the low-polygon model was an ambient occlusion map, generated from a programme called xNormal. This process produced a global ambient shading map that enhanced the 3D geometry of the object, such as shading recessed areas on carved stones or the area between stone blocks in built structures. The Faro Focus scanner does not capture suitably high-resolution data for a final model so spherical HDR images were captured using a Canon EOS 5D mkII and a Gigapan Epic Pro. Utilising MARI 3D texture painting software, these spherical images were projected onto the model and the photo texture extracted without the evidence of parallax errors. The results – textured or enhanced shaded models – achieved the objective of the project and could be repeated for models at the other scales, landscapes and detailed stones, using the same processing principles. The final phase of the project was to find a suitable web platform that provided online access to the models. Sketchfab was chosen, a website that enables users to display and share 3D content online. It provides a 3D model viewer based on WebGL technology that can be embedded on any mobile or desktop webpage. A Discovery Programme Sketchfab page was established to host the 3D-ICONS project models (see Figure 2), and the wider range of 3D content being created. The EU funding of the 3D-ICONS project ended in January 2015, and as such the project and its activities came to a close. The outcomes and legacy of the project was its website, largely focused on accessing the metadata of the models created, and a publication of guidelines (MDR Partners 2016a) and case studies (MDR Partners 2016b). 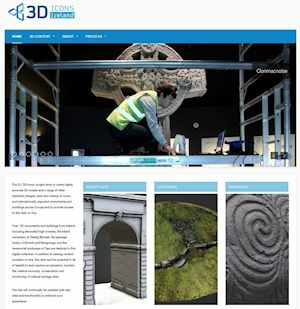 However, the response in Ireland to the project was overwhelmingly positive so the Discovery Programme decided that the 3D content created for the European project should be given its own dedicated website, with the potential to add 3D models of new monuments, maintaining the momentum in 3D modelling established by 3D-ICONS. 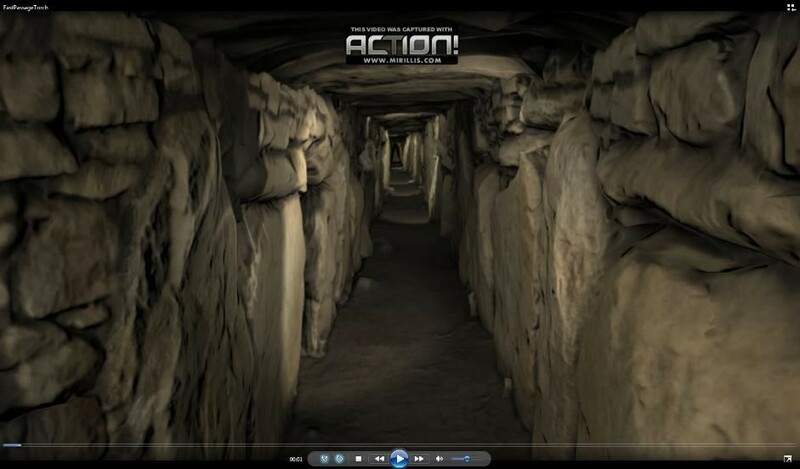 Launched on 15 April 2015 by Heather Humphries TD, Minister of Arts Heritage and Gaeltacht, with coverage on the national television news (RTE 2015) and online media (Irish Times 2016) this website has proved to be the catalyst for a number of exciting and diverse applications utilising the rich 3D content generated for the European project. The Irish website, called 3D-ICONS Ireland, Figure 3, was designed and built utilising Joomla CMS in house at The Discovery Programme over the following months, with narratives, images, videos and models created for each site accessible by search, list or map interface. It is a relatively simple website with a clean design, chosen to appeal to as wide an audience as possible. Traffic has fluctuated, with spikes reflecting promotion or publicity, but generally at the level of 50 engagements per day through the 3dicons.ie website and varying levels of use of the 3D models directly through Sketchfab, with the most viewed models having an audience of 41,000 users (as of 3 Feb 2017). Although we instinctively felt that 3D-ICONS Ireland had the potential to become an educational resource it was somewhat by chance that the opportunity arose to pursue this agenda. Through word of mouth, we became aware that the 3D-Icons website was being used as a classroom resource by secondary teachers in a local school, so we arranged a meeting in the school to discuss their experiences. The Junior Certificate history curriculum and the History of Art Leaving Certificate curriculum both included the vast majority of the site types included on the website (Delap and McCormack 2011; Fahey and Geoghan-Treacy 2011). Like their colleagues in Britain and elsewhere, the people who teach archaeology in Irish schools do not have degrees in archaeology (Planel 1990). Instead they are teachers of history and art history with degrees in those subjects. We need to provide resources that allow these teachers to show their students that archaeology and material culture are an important source of information in their own right rather than just an addition or illustration for the historical record (Moreland 2001). This is essential if we are to ensure that future generations of Irish students are archaeological literate and concerned with the preservation and research of archaeological sites. We discussed with the teachers both how they used the website and what we could do to improve its usability. In the first year history class the teacher used the website to illustrate her instruction; she navigated the website and showed the students the images on a large projection screen. In this case, the students' use of the website was passive but they were encouraged to access the website at home. As a follow-up to this exercise, the students were asked to compile drawings of the site types they had seen on screen, and in the case of an Early Medieval monastery they were tasked with labelling the different structures and areas within the monastery. The Art History teacher adopted a more participative approach, where he not only projected the images onto a central screen but also encouraged the students to look the images and navigate their way through them using their smart phones. The spaces between monuments in an archaeological complex are considered by the students as well as the monument itself. The students are asked to consider the difference between seeing a site as a 3D model onscreen and seeing it in reality. Before the class visited Bru na Boinne, they researched the site on 3D-ICONS Ireland as well as a number of additional sources. 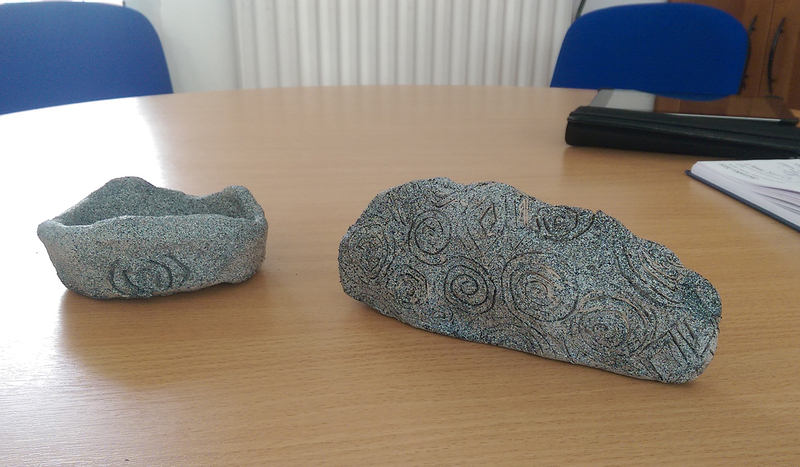 Finally, the class made clay models of some of the features at Newgrange, including the entrance stone (Figure 4), using the online 3D models as their primary source material. The older students were allowed to have greater autonomy in their learning, and were encouraged to search for information themselves. The younger students were strictly guided through the resource, and teachers of this cohort indicated that a dedicated schools section on the 3D-ICONS Ireland website should be developed that would encourage independent learning and inspire students to find answers to their questions. All the teachers we spoke to suggested that the inclusion of more interaction with the online models through the use of information/hot spots in the models is desirable, and that the information provided should include historical as well as technical information. They also stressed that these descriptions should be written in an accessible style, with language that is appropriate to the students and reflects the language used in their text books. They also agreed that videos showing the process of data capture as well as interviews with the staff carrying out the survey were desirable. Contact was made with the History Teachers Association of Ireland and a presentation on the site was made to their committee, highlighting the site's potential uses in the classroom environment. Following on from this meeting, details of the website were circulated to all their members by email and posted on their Facebook page. They also indicated that they planned to include the 3D-ICONS Ireland website in a session on interactive teaching methods for the Junior Certificate. 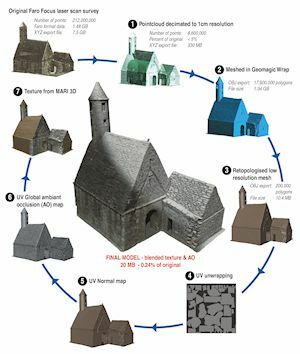 Additional activities within education included first-year students at Southeast Missouri State University, USA, using 3D printers to create models of St Kevin's Church and the Market Cross at Glendalough as part of a course on pre-modern European History (Figure 5). The students were set the assignment during a module on early medieval European monasticism. Split into groups of four or five, they selected one of the sites to print and research. Students worked in the multimedia centre to create explanatory material to accompany their 3D print, with one group choosing to make a podcast. Their assignment specified that the explanatory material should include the historical context of the artefact as well as the how 3D printing could be used in a public history context. The vast majority of the students at Southeast Missouri State University have never left the USA, and many have never left the region. Consequently, they can sometimes find it difficult to visualise and thus truly understand the places they are learning about. Medieval Europe seems very distant and alien to them and they struggle to comprehend that they are learning about the lives of real people, just like them. By being able to handle a tangible object that directly connects them to a distant place and time it was felt that they had helped to close this gap. Several of them remarked that it was 'cool' to be able to touch something that came from medieval Ireland. The enthusiasm of the students for the project was also illustrated by the fact that many of them conducted additional research in their own time and that they consulted the library's print materials during this research (something their lecturer was keen for them to do but which they had previously been reluctant to attempt). Due to the high quality of the work produced, the 3D prints and their accompanying explanatory material were displayed in exhibition space in the University Library. This exhibition was so successful that the library requested that it be left on display for longer than had been originally planned. Looking ahead we would like to encourage more students to use 3dicons.ie by increased promotion of the site, developing the website to make it more user-friendly and implementing some of the suggestions we received from teachers. The inclusion of links to the website from the Heritage Council Map Viewer should also increase its visibility. The example from Southeast Missouri State University indicates the potential uses for the background data that was used to create the models. At the moment these data are available on request to those using it for educational and non-commercial reasons; facilitating access to the data for greater numbers of researchers as its potential become apparent will present its own challenges. 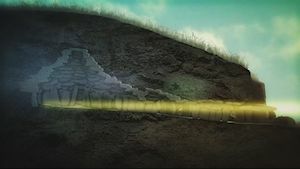 The public appetite for 3D models of archaeological sites is indicated by the high levels of engagement on social media (specifically Facebook and Twitter) whenever a video or model is posted online. Tourism in Ireland is strongly associated with the wealth of heritage sites that attract visitors from around the world. The experience offered to the visitor ranges from free unguided access to controlled tours with restricted access, such as in the Brú na Bóinne. The Office of Public Works (OPW), who manage many sites, were interested in how the 3D data gathered through the 3D-ICONS project might be used to develop more interactive experiences, and particularly give visitors glimpses, albeit in a digital environment, of areas where access is restricted. As a pilot study, the East and West passages in the great chambered tomb at Knowth, normally closed to visitors, were chosen to see how the 3D data could be developed into an immersive, virtual model. 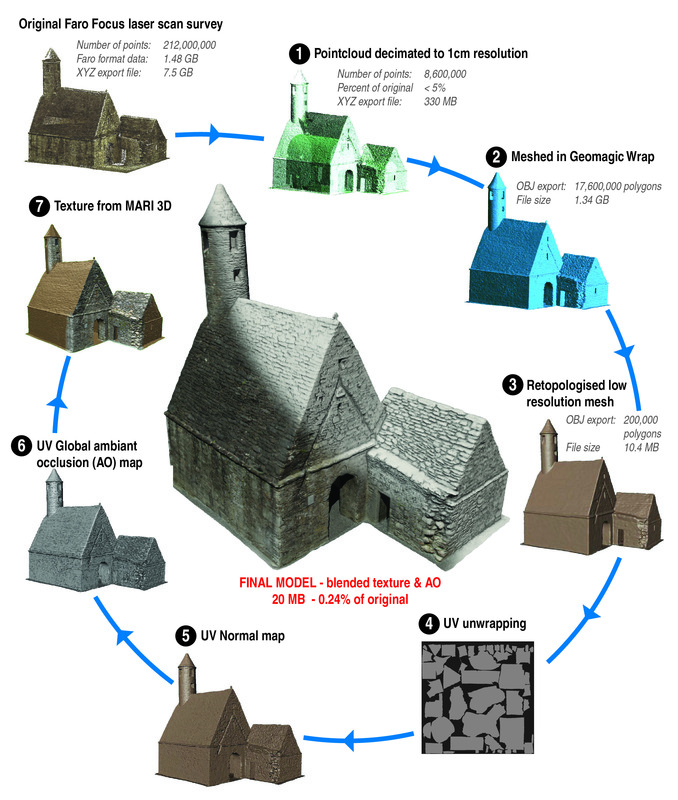 The production process was an extension of the pipeline developed for the 3D-ICONS project (see section 3), using gamification methods to produce visualisations of Irish Heritage sites. The original survey data gathered for Knowth as part of 3D-ICONS was high-density point cloud data, and this was brought into Realworks to be cleaned and segmented into smaller manageable segments. These pieces were separated in such a way to effectively hide seam lines from the viewer, as well as breaking them into roof, floor and wall sections. Again, as in the 3D-ICONS processing path, we took the segmented point clouds, created meshes, which were then decimated and retopologised and high-detail UV maps were extracted from the detailed model to apply to the low-polygon mesh. 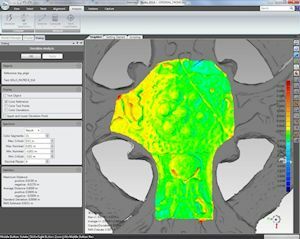 An additional process was to add fringes of edge loops extending from the boundary of each passage segment to allow for overlapping of the retopologised passage segments. Given the low lighting and confined space of the passage, as well as time constraints/lack of ease of access to the passages it wasn't viable to capture imagery to use in completely photorealistic texturing. Instead, sample photography was captured at several points throughout the passages and used to build a swatch for the stone surfaces. This swatch was then used as a palette to paint custom diffuse textures for each passage segment. The resulting diffuse maps were combined with the previously extracted ambient occlusion and normal maps on each passage segment to re-create the detail on the faces of the standing stones. A massively high-polygon model of the Knowth passages was brought in to 3DSmax to align each segment properly. The aligned models were then brought into Unity. In Unity the texture maps were applied, along with lighting. The decision was made to bake the lighting into the scene to save on real-time rendering, as well as enable the use of another level of ambient occlusion, this time built into the model as a whole rather than separated by segment. This allowed for more even texturing and a more balanced finish. After the scene was built and all physical assets of the levels were created and textured, the next phase was adding a controllable character and then building the User Interface (UI). Our plan is to develop both a standard screen-based experience as well as an immersive Virtual Reality (VR), utilising Oculus Rift viewing device. Using some standard UI assets provided by Unity as well as some customisation, we managed to build a first-person experience for the Knowth passages. With the technical challenges resolved the virtual environment is now ready to be made public, with discussions on how it may be installed to enhance the visitor experience to Knowth in the near future. Figure 6 gives an impression of the final model, taken from a video navigating the passage. Licensing 3D models of monuments can assist film companies in the production process. 3D models can enhance the pre-production process by enabling the visualisation of potential filming locations and enhance the planning and efficiency of shot creation during the filmmaking process (Zwerman and Okun 2014). The ability to provide detailed 3D models of historic sites to this industry could be used as an incentive to attract new productions to Ireland who may virtual 'scout' potential filming locations. During the production phase 3D content can be used to construct real-world surrogates and replicas, which would negate the potential conservation concerns of film production at protected sites. Finally, 3D content could be used directly within post-production, enabling the creation of realistic and historically accurate digital environments. Meetings have taken place between the Discovery Programme and the Irish Film Commission (IFC) to explore this approach, and to gauge to what extent the film industry values historical accuracy. Several enquiries have been made by individuals about the availability of 3D printed models of heritage structures and carved stones. As we do not possess a 3D printer within the Discovery Programme we have been unable to answer these requests. In addition, if a 3D printer was available it would be an inefficient use of our resources to offer kiosk 3D printing service. To explore the potential further we are establishing partnerships with commercial 3D printing companies who offer such services. 3D models will be licensed for printing and commercial sales, with the Discovery Programme receiving a royalty payment for each sale. 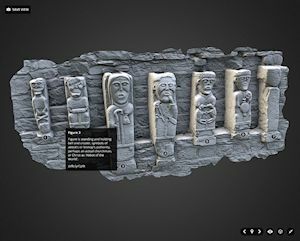 Fáilte Ireland's 'Ireland's Ancient East (IAE)' tourism initiative has brought much attention to the 3D assets and content generated during the 3D-ICONS project. Several commercial companies have now licensed several models for the creation of promotion videos (see Irelands Ancient East 2016a; Figure 7). In addition, the ability to embed reuse of the Sketchfab models in the form of iFrames in HTML has also been employed (Irelands Ancient East 2016b). It is envisaged that as this new initiative gathers momentum the ability to commercially exploit 3D and additional digital content will increase. One aspect of commercialisation that requires greater inspection by the cultural heritage community is the development of several business models, with accompanying 'boiler plate' licensing agreements that would aid small institutions exploit the full commercial value of their digital assets. Although the objective of 3D-ICONS was to create low-polygon accessible models of the heritage sites and objects for dissemination and public engagement, the Discovery Programme from the outset defined a scientific approach to the data collection, regardless of scale. Given the privilege of being granted access to these sites, in return they deserved high-quality 3D documentation to recognised standards (Andrews et al. 2015). Data of this quality have the potential to be an extremely valuable resource in the maintenance, care and conservation of sites and monuments. The point clouds generated are a time-stamped record of the condition of a site at the time of survey, and if re-surveyed in the future to a similar resolution then they become a valuable bench mark not only to detect but also quantify even subtle change through cloud comparison. A number of the monuments included in the 3D-ICONS project present conservation challenges to state agencies who maintain them – Gallarus Oratory, Cahergal Stone Fort and particularly the monastic settlement on Skellig Michael. Here a pilot monitoring project was established in 2015, looking at both cloud comparison and geodetic marker observations to establish a best practice monitoring regime. Data gathered primarily for 3D-ICONS have already fed into academic research, a good example being the Digital Replica Project, a collaboration between The Discovery Programme, UCD School of Archaeology and CRDS Ltd. A module of this project is investigating the 19th-century moulds and casts of the High Crosses of Ireland. A selection of these crosses were scanned for 3D-ICONS, and subsequently the Digital Replica Project has looked to locate and then scan – using identical equipment and documentation methodology – the corresponding plaster cast replicas or moulds. Given the level of detail being recording by scanning the originals, could a framework of research questions be established that could be answered by scanning the replicas through this digital documentation and modelling? 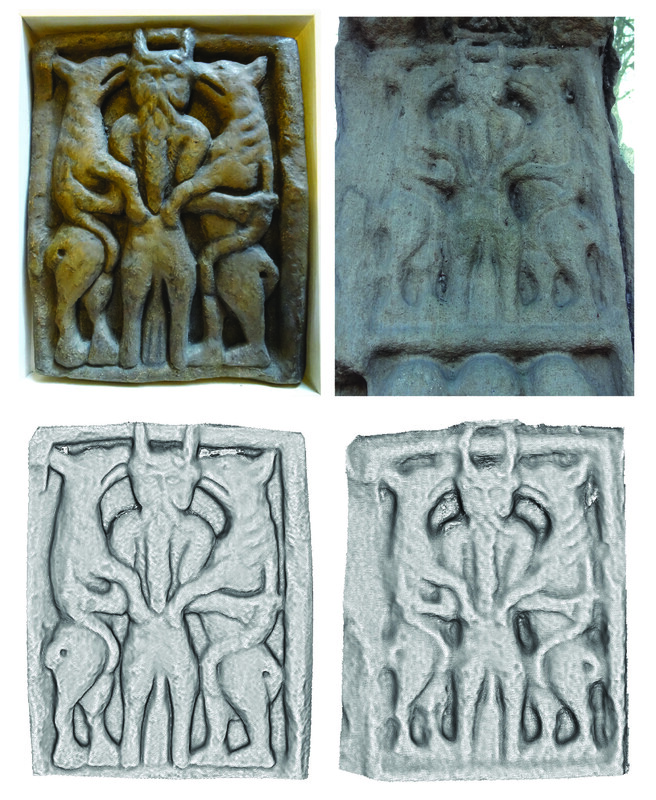 Quality and geometry – how well do the replicas appear to have been made? Do the overall geometry and metrics match the original? Is there any distortion or twisting? How are the complex elements with depth represented? Erosion and decay – if the original has been left exposed to the elements could a scan of both replica and original detect and quantify change? Do the replicas and/or moulds preserve details that are now lost on the original? Authenticity – in finishing the replicas has smoothing or embellishment taken place? 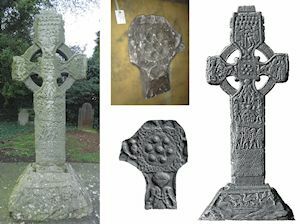 At this stage only preliminary work has been done, working with some moulds and plaster casts of the Kells crosses, but even so interesting results are being achieved. A mould of the centre of the Cross of St Patrick and St Columba was located in the OPW storage facility in Daingean, Co Offaly, and was scanned and modelled using the Artec EVA scanner (Figure 8). 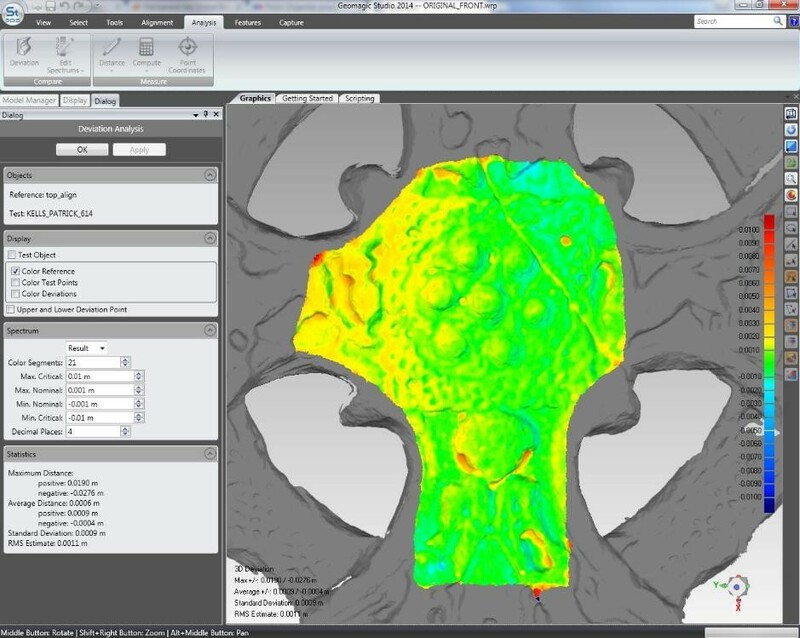 The subsequent surface model was compared with the surface model from the scan of the original cross, and a deviation analysis applied in Geomagic Studio software. The results, shown in Figure 9, provide evidence that might provide answers to the research questions. The overall fit is remarkably good, RMS 0.0011m, with the largest deviations being in the deeper cut sections of the stone. This could be an artefact of the moulding process, but other possible explanations such as weathering and erosion may be identifiable as the research and analysis continues. 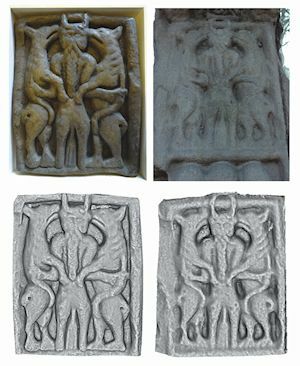 The complexity of this analysis was highlighted when a plaster cast was scanned, this time of a single panel of the Kells Market Cross, the 'Hound Lord'. The deviation analysis quantified the variations but a visual inspection easily identified differences between the model and introduced the concept of deliberate artistic smoothing or embellishment taking place in the replication process (Figure 10). In this case, the feet of the beasts appear exaggerated and enhanced in the replica, as does the beard and moustache. The 3D-ICONS project provided The Discovery Programme with an excellent opportunity to work with leading partner institutions in Europe to further our understanding of the processes involved in bringing 3D models of iconic heritage sites to the public. It also created an exceptional resource, 3D models of Ireland's outstanding cultural monuments, which have been served to the public through the development of the 3D-ICONS Ireland website. This resource has been pivotal to the exciting applications and developments that followed and have been highlighted in this article. Nearly all are in their infancy, and will hopefully fulfil their potential in the coming months and years. 3D-Icons was co-funded by the European Commission's ICT Policy Support Programme. The authors would like to acknowledge the help and support of the following, without whom the 3D-ICONS project would not have been such a success. Surveyors: Hugo Martin (DIT), Lorcan Scully (UCD), Philip Behan (DIT), Lukasz Banaszek (Adam Mickiewicz University of Poznan), Charlie Yuill (West Virginia University), Paul Bryan (English Heritage), David Andrews (English Heritage). Office of Public Works: Frank Shalvey, John Cahill, Grellan Rourke, Ana Dolan, John O'Brien, Ken Curley, Breda McWalter, George McClafferty, Peter Boyle, Sharon Downie, Padraig O'Tuairisc, Marian O'Brien, Brónagh McGuinness, Niall Bergin and all additional staff at OPW manned sites. National Monuments Service (DAHG: Ann Lynch, Tom Condit, Con Manning, Edward Bourke. Northern Ireland Environment Agency (NIEA): Claire Foley, John O'Keefe. UCD School of Archaeology: Graeme Warren. National Parks & Wildlife Service: Damian Clarke. Meath County Council: Loreto Guinan, Fiona Beers, Jill Chadwick. Hollywell Trust: Mark Lusby, Shawn Whoriskey. FabLab, Derry: John Peto, Paul McCay, Eamon Durey. KOREC: Mark Poveda. Southeast Missouri State University: Dr. Vicky McAlister, Assistant Professor of History. Andrews, D., Bedford, J., and Bryan P. 2015 Metric Survey Specifications for Cultural Heritage, 3rd edn. Swindon: Historic England. Curry, A. 2015 Here Are the Ancient Sites ISIS Has Damaged and Destroyed. http://news.nationalgeographic.com/2015/09/150901-isis-destruction-looting-ancient-sites-iraq-syria-archaeology/ [Last accessed: 15 June 2016]. Delap, S. and McCormack, P. 2011 Uncovering History, 2nd edn, Dublin: Folens. Fahey, T. and Geoghan-Treacy, S. 2011 History and Appreciation of Art, Dublin: Folens. IPOL-CULT_EU 2007 Protecting the Cultural Heritage from Natural Disasters http://www.europarl.europa.eu/RegData/etudes/etudes/join/2007/369029/IPOL-CULT_ET(2007)369029_EN.pdf [Last accessed: 15 June 2016]. 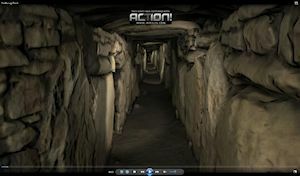 Irelands Ancient East 2016a Ireland's Ancient East – Ancient Ireland | Visit the East of Ireland. http://www.irelandsancienteast.com/stories/themes/ancient-ireland [Last accessed: 15 June 2016]. Irelands Ancient East 2016b Ireland's Ancient East – Sacred Ireland | Visit the East of Ireland. http://www.irelandsancienteast.com/stories/themes/sacred-ireland [Last accessed: 15 June 2016]. Irish Times 2016 VIDEO: Capturing Ireland's most iconic monuments in 3D. http://www.irishtimes.com/news/environment/capturing-ireland-s-most-iconic-monuments-in-3d-1.2178100 [Last accessed: 15 June 2016]. MDR Partners 2016a Guidelines/Guidelines & Case Studies/Home – 3D-ICONS http://3dicons-project.eu. http://3dicons-project.eu/eng/Guidelines-Case-Studies/Guidelines2 [Last accessed: 15 June 2016]. MDR Partners 2016b Case Studies/Guidelines & Case Studies/Home – 3D-ICONS http://3dicons-project.eu/eng/Guidelines-Case-Studies/Case-Studies [Last accessed: 15 June 2016]. Moreland, J. 2001 Archaeology and Text, London: Duckworth. Planel, P. 1990 'New archaeology, new history – when will they meet? Archaeology in English secondary schools' in P. Stone and R. MacKenzie (eds) Excluded Past – Archaeology and Education, 1st edn. London. 271-81. 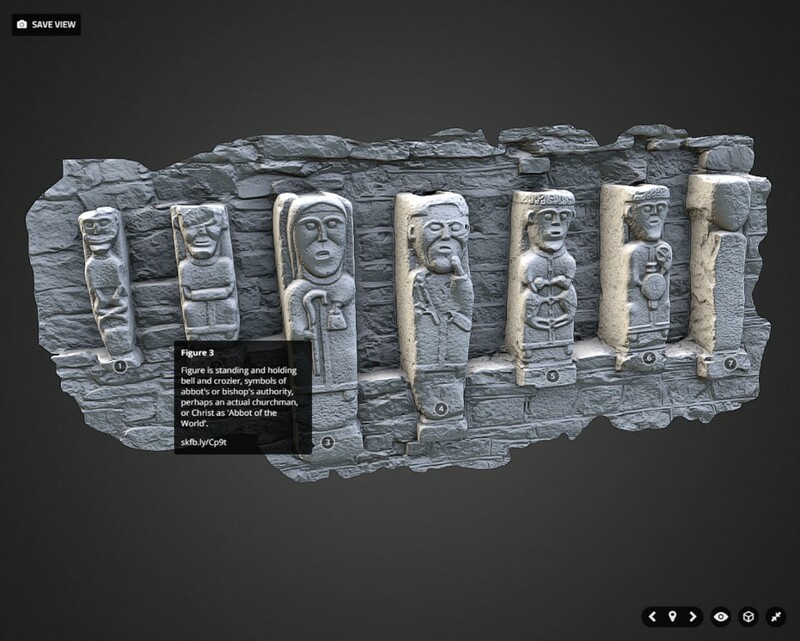 RTE 2015 Website Offers 3D Models of Heritage Sites. http://www.rte.ie/news/2015/0416/694526-heritage-sites-ancient-monuments/ [Last accessed: 15 June 2016]. World Heritage Ireland 2016 Tentative List. http://www.worldheritageireland.ie/tentative-list/ [Last accessed: 15 June 2016]. Zwerman, S. and Okun, J. 2014 The VES Handbook of Visual Effects: Industry Standard VFX Practices and Procedures, CRC Press.